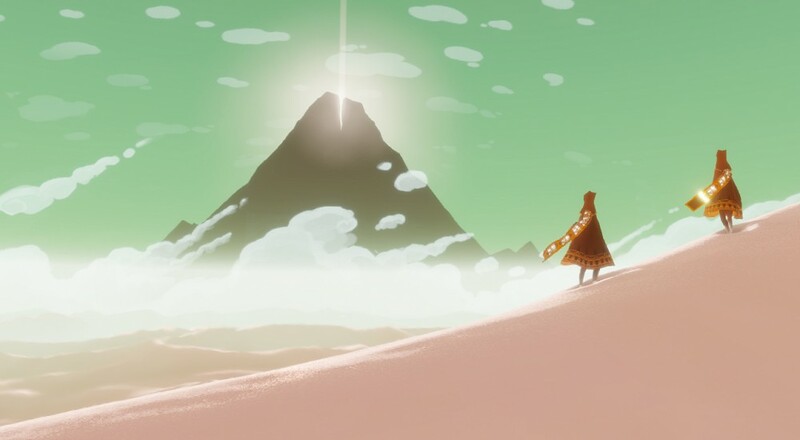 Journey is a co-op game where the goal is not the main focus. Your hooded figure must make their way to the mountain hidden in the distance, but the real magic lies along the way. You'll race across sand dunes, discover hidden secrets, tapestries, murals, and encounter dangerous foes. You are never alone, however. You'll always find a friend when you need it. Every element harmonizes to make each journey unique. From the orchestral, lonesome music, to the intense rush of flight, to the discovery of a new location, Journey can move you the way few games can.. You aren't working together to complete it; you and your new friend are experiencing something magical, together. It is a slow, wonderful game punctuated by scenes of levity. We loved Journey so much we awarded it our highest accolade. It is difficult not to adore a game when it awakens you to feelings you've never known before. Journey is the only video game ever to be awarded a Grammy nomination, and for a limited time, you can pre-order a dual vinyl package for $35. If you prefer vinyl over other platforms, you might want to consider snagging it. Page created in 0.3013 seconds.